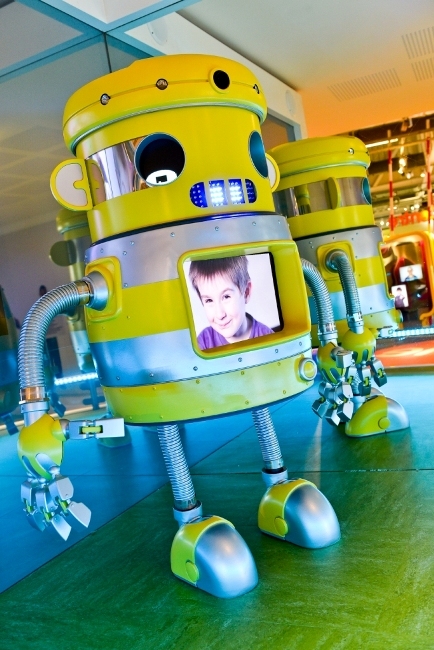 Halifax-based Limehouse has designed an iconic new mascot robot ‘Zoom’ for the new £2.9m Eureka! All About Me gallery as part of the contract to design, produce and install the complete audio visual system for the gallery. Award winning, full service agency Limehouse scored a home win at the end of last year when it was awarded the coveted contract by Eureka! The agency has a strong heritage of working with museums nationally including The National Media Museum, International Slavery Museum and National Museums Liverpool. Loveable robot ‘Zoom’ meets and greets visitors on arrival and appears throughout the gallery. All About Me is an immersive educational experience that uses play, role playing and interactive displays to help children learn about their bodies and how to make positive choices that will help them look after themselves. With exciting hands-on exhibits, vibrant colours and exciting sounds, children can get involved and try everything out for themselves. Limehouse worked closely with the Eureka team from the outset getting under their skin and carrying out in-depth research to truly understand the primary focus of the gallery – to captivate its key target audience, children. The project included creation of a wide range of large scale illustrations, special effects video and photographic shoots, a wide selection of animations, an interactive computer game and a variety of informative video modules. Included in this was the development of Zoom, the gallery mascot, to introduce the children to gallery and interact with them during their visit. The Limehouse team recognised that it was important for children to engage with and relate to the new mascot, so who better to ask for input than children themselves. Limehouse spent many inspirational hours gaining creative feedback from youngsters at nine local schools* working with them to analyse their robot likes and dislikes. A series of designs were developed and Zoom was born, a full 3D animated robot, who came to life as a fully animated and chatty character that greets visitors as they enter the gallery and embodies the heart and soul of the younger members of our community. “This brand new gallery has to be engaging, relevant and inspiring to children and families – it has to captivate visitors of all ages and have a positive and lasting impact – so Limehouse had their work cut out with this project. True to their award winning style and strong heritage of working in the museum sector, Limehouse took the pressure out of the project and made the process simple and easy to understand. All About Me has been developed with the support of a £1.45m grant from the Wellcome Trust, the global charitable foundation, and comes at a critical time in the health of the nation when even greater focus is being placed on the health and well-being of children and families.